All Purebreds Are Not Created Equal! What Sets Sunshadows German Shepherds Apart? Useful Things to Know about buying a German Shepherd... or any dog, for that matter! There are a few things that may be useful to understand about the German Shepherds you'll be seeing on your web search. You'll note a vast discrepancy in prices in your first glance, and I'll try to address why that is. First: Registered Shepherds vs Unregistered ones. Registered dogs have a recorded pedigree that goes back many generations. The records are stored at a central location where the breed registry is kept; generally by an official government regulated body. In Canada, this is the Canadian Kennel Club, the CKC. There are all sorts of regulations in place to ensure that dogs are presicely what their breeders claim them to be, and that the parents are registered so the bloodlines remain pure. This ensures that German Shepherds are not mixed with Pomeranians and vice versa. 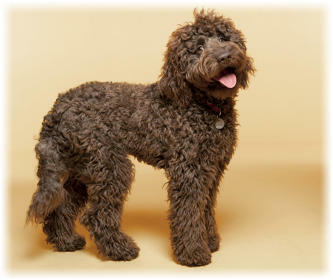 Labradoodles are a popular mixed breed that cannot be registered and are not 'purebred' dogs. Many of the dogs you'll see advertised are not registered, and although they may look like purebreds - and may actually be - there is no way to ensure that they are. These dogs may be produced by 'backyard breeders' who happen to have a Shepherd and who have a friend who has one, and they agree that their dogs are just the best thing they've ever seen. Nodody wants to go to the expense and bother of registering a breeding kennel, doing the paperwork and paying for litter registrations, so they just breed the two dogs, produce puppies and advertise them as GSDs (German Shepherd Dogs). This is semi-allowable unless they claim that the dogs are "Purebred". If they do that, they've broken the law. If only one of the parents are registered, the pups may not get registered until the other parent becomes registered. As a result, unregistered dogs will usually sell for significantly less money because they cannot be shown in official competitions. Besides, these are hobby breeders and they generally do not invest a lot in the process, sometimes missing vaccinations, worming, etc, and even trying to sell the pups before the optimal 7 weeks of age. The Husky Sheppard cross is another common mixed breed. Second; Different Lines of Shepherds = Different Purposes. In the '60s, the breed got split into two sub-breeds; working lines and show lines. The show lines are mainly bred for their conformation; that is, structure and movement, and these dogs are beautiful to see, moving gracefully and stacking (the stance needed for the show ring). There were some sacrifices made to achieve this look. The breeders at the time unintentionally gave up some if the highly desireable traits that the original Shepherds were bred for; that is, fighting spirit, prey and defensive drive, desire to work, and the sturdy, squarer stance displayed by all the other canids seen in nature. By far the largest group of GSD breeders fall into the show category. Showing a dog requires much less work than training it to track, do obedience, and do protection tests. Currently, there is an effort to attempt to bring the two lines back to one, but the problem is that no show breeder will breed to a top working line dog, nor will a working dog owner breed to a show line dog! Each time this has been tried in the last 30 years, the product was unacceptable to both groups. We got dogs that were reluctant to work that would fare badly in shows! The efforts do continue however, and we wish them luck. There may be as many as 30 or so working Shepherd breeders in Canada, but there are many, many more breeders of the show lines, so how do you tell the difference? Look for titles behind the names of the parents. IPO, SchH, and all the Herding, Obedience and sport titles tell you that at least the parents are trainable and have some drive to work. The 'real' telling titles are the IPO (International Trial Rules) and SchH (Schutzhund) titles that prove that the dog has attained standards in tracking, obedience and protection tests. These are the tests that the Germans designed in order to select dogs that are elegible - deemed worthy - of being bred. Useful Things to Know about buying a German Shepherd... or any dog, for that matter! There are a few things that may be useful to understand about the German Shepherds you'll be seeing on your web search. You'll note a vast discrepancy in prices in your first glance, and I'll try to address why that is so. First: Registered Shepherds vs Unregistered ones. Registered dogs have a recorded pedigree that goes back many generations. The records are stored at a central location where the breed registry is kept; generally by an official government regulated body. In Canada, this is the Canadian Kennel Club, the CKC. There are all sorts of regulations in place to ensure that dogs are presicely what their breeders claim them to be, and that the parents are registered so the bloodlines remain pure. This ensures that German Shepherds are not mixed with Pomeranians and vice versa. Labradoodles are a popular mixed breed that cannot be registered and are not 'purebred' dogs. Many of the dogs you'll see advertised are not registered, and although they may look like purebreds - and may actually be - there is no way to ensure that they are. These dogs may be produced by 'backyard breeders' who happen to have a Shepherd and who have a friend who has one, and they agree that their dogs are just the best thing they've ever seen. Nobody wants to go to the expense and bother of registering a breeding kennel, doing the paperwork and paying for litter registrations, so they just breed the two dogs, produce puppies and advertise them as GSDs (German Shepherd Dogs). This is semi-allowable unless they claim that the dogs are "Purebred". If they do that, they've broken the law. If only one of the parents are registered, the pups may not get registered until the other parent becomes registered. As a result, unregistered dogs will usually sell for significantly less money because they cannot be shown in official competitions. Besides, these are hobby breeders and they generally do not invest a lot in the process, sometimes missing vaccinations, worming, etc, and even trying to sell the pups before the optimal 7 weeks of age. Second; Different Lines of Shepherds = Different Purposes. In the '60s, the breed got split into two sub-breeds; working lines and show lines. The show lines are mainly bred for their conformation; that is, structure and movement, and these dogs are beautiful to see, moving gracefully and stacking (the stance needed for the show ring). There were some sacrifices made to achieve this look. The breeders at the time unintentionally gave up some if the highly desireable traits that the original Shepherds were bred for; that is, fighting spirit, prey and defensive drive, desire to work, and the sturdy, squarer stance displayed by all the other canids seen in nature. By far the largest group of GSD breeders fall into the show category. Showing a dog requires much less work than training it to track, do obedience, and do protection tests. Currently, there is an effort to attempt to bring the two lines back to one, but the problem is that no show breeder will breed to a top working line dog, nor will a working dog owner breed to a show line dog! Each time this has been tried during the past 30 years, the results have been unacceptable to both groups. Dogs that were not only reluctant to work, but also fared badly in shows! The efforts do continue however, and we wish them luck. There may be as many as 30 or so working Shepherd breeders in Canada, but there are many, many more breeders of the show lines, so how do you tell the difference? Look for titles behind the names of the parents. IPO, SchH, and all the Herding, Obedience and sport titles tell you that at least the parents are trainable and have some drive to work. The 'real' telling titles are the IPO (International Trial Rules) and SchH (Schutzhund) titles that prove that the dog has attained standards in tracking, obedience and protection tests. These are the tests that the Germans designed in order to select dogs that are elegible - deemed worthy - of being bred.